This blog post is a response to this article. 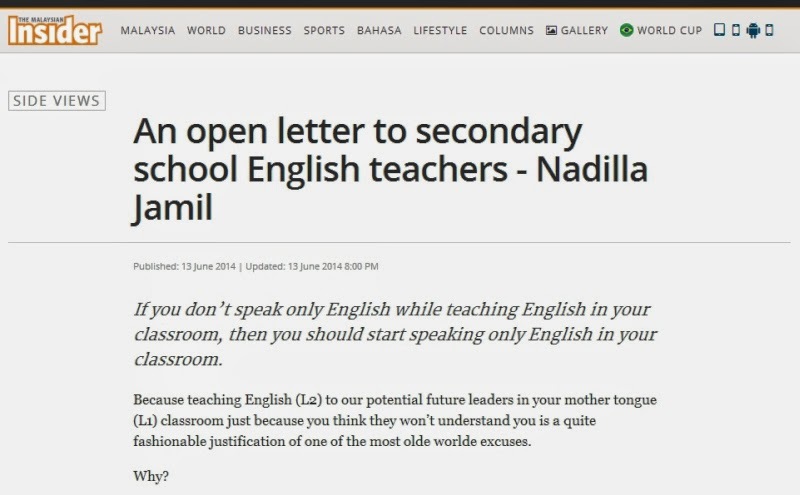 This is a long blog post in response to Nadilla Jamil's article 'An open letter to secondary school English teachers' which was published by the Malaysian Insider on 13 June 2014. - English is fun. Bring along your games, movies. Act out. Consider role-plays. Let our potential future leaders learn the language through music. - I passionately believe that the trouble is that education doesn't go on in the committee rooms of our legislative buildings. It happens in classrooms and schools, and the people who do it are you and them as students. And if your discretion is removed, trust me, our education will stop working. - as an English teacher, you are not a grammar nazi who will red-mark or point out every single written and verbal grammatical mistake of our potential future leaders. - Don’t rob their confidence. Don’t kill the language-learning joy. Don’t make them feel timid. Don’t sabotage their language learning by speaking in L1 in their L2 classroom. - the more you speak and let our potential future leaders speak L1 in L2 class; the longer they will remain in miserable limbo of being unable to communicate in that language. - we can never learn English by speaking in and listening to another language. No one ever has mastered a language this way. And no one will. - your mission is not only to let them know how to read and write in English to pass their exams. Your mission should be that so that one day they can THINK critically when they converse and read in English. A teacher describes how he tried to use only English to little effect and then finds success when he uses the mother tongue in his lessons. Students understood the task & proceeded to make use of the target language to complete their tasks which are essential to success in SPM. A teacher trainer argues that the use of mother tongue is acceptable in the second language classroom. I did some sleuthing because I thought that she was probably a renowned teacher trainer or researcher or master teacher whom I could learn from & what I have found will surprise you. Siti Nurnadilla Mohamad Jamil is a PhD student in Discourse and Rhetoric at Loughborough University. She did an MA in Discourse Studies at Lancaster University. She has a Bachelor's from the International Islamic University Malaysia in Linguistics. She was a TESL undergraduate for a year at UiTM Shah Alam. I was disappointed when I found out that she was not involved in the education field at all. This explains a lot about the way the open letter was written. It was more of an opinion piece with a lot of personal 'beliefs'. Those beliefs probably came from a reflection on her schooling experience embellished with some knowledge of language teaching theories. Also, this is not the first article of hers to be published by the Malaysian Insider. Her articles are all written with the same conviction. She is quite a liberal & she is open about it. I can tell that she hopes that she will win more of her people to her world-view. As a 25 year old, her articles are usually addressed to youth. This is the first time she has targeted teachers. She is definitely someone with a bright future & will do Malaysia a lot of good should she choose to return. I really hope that she does. She will probably make a good politician one day. She reminds me of a young Sharyn Shufiyan. Dear Nadillah, thank you for your article. I want to commend you for bravely voicing out your thoughts & taking on the 60k+++ strong English teaching workforce. We do need reminders of what we are capable of & what we are responsible for. It is indeed humbling to receive such reminders from a young intellectual. I am not an expert in English language teaching & I have limited experience in teaching but I want to speak up for my fellow teachers when I see them being targeted in the media. I hate teacher-basing & I strongly believe you do too. Teachers tend to keep quiet when this happens. But, when an opinion is falsely perceived as fact, I am compelled to step in & share my OPINION. Nadilla's ideas are not new but they are simplistic. Not all schools in Malaysia are the same. Even in the same school, not all classes are the same. She is probably drawing most of her ideas from research of second language acquisition in a NATIVE-speaking environment. Think about it. In Malaysia, except in some urban areas, most students learn English as a FOREIGN language which has no immediate real-world application. Keep in mind that not all teachers work in well-equipped schools with students who wish to learn. There are extremely rural schools where students only really start learning English in secondary school. There are also challenging schools in urban areas which are ridden with discipline issues which constantly disrupt classes. For some of the classes in these schools, full English is possible. For some, we might need to give teachers the benefit of the doubt. I have nothing against the use of another language in the classroom. I am, however, against the FULL use of the mother tongue in the classroom. Teachers should strive to use as much English as possible & challenge their students within their zone of proximal development. Teachers should be entrusted to make their own INFORMED decisions on this. Factors influencing the use of English include: teacher-student rapport, teacher ability, lesson objectives, student willingness to stretch themselves, student discipline, student ability, student achievement, class history & school culture. I think that all teachers should at least conduct their lessons entirely in English at the beginning. They should also do this with the assumption that students will understand. Students pick up on teacher's expectations & deliver accordingly. As teachers develop a better understanding of the school & their students, they can decide whether it is beneficial to employ whatever degree of code-mixing for specific lessons. Decisions must be thoughtful & never reactive. For teachers who are using English entirely AND your students are learning, good for you. For those who do not, you better have a bloody good explanation. I am not an expert teacher so take my OPINION with a pinch of salt. I have really weak classes with a lot of catching up to do & I am pushing them every day. What is important is our students are learning & progressing. If we haughtily use English entirely just for the sake of it, we might miss the point altogether. A great teacher should use everything in his arsenal to push & pull his students to success & that also includes knowledge of the students mother tongue (which is why I have learned to speak Bahasa Iban). The students in my weakest classes are motivated & progressing in their English. Am I a bad teacher because I use code-mixing to make the above happen? For centuries, we teachers have been told what to do by every possible layer of society; from ministers to professors to administrators to parents to students to other teachers themselves. So far, we have taken all of your concerns quietly into consideration because we know that we serve all the stakeholders & we trust our policy makers to make the best decision for the future of our nation. Can I speak honestly? Can I? Please? Can a teacher say something this time? Honestly, we are tired of being TOLD what to do. We want to be SHOWN what to do. This is my challenge to anyone who wants to speak. PROVE to me through your own efforts that all you say is true. Become an English teacher. And please don't dabble. One year is nothing. Stick with it for a few years & actually try your best. Just like how you would want us to do. Oh oh oh... And do this not at a premier school. Teaching at a Putrajaya, MARA, Sains or cluster school is kind of like cheating, no? Go to a challenging school. A school where the students are weak in English & many English teachers have already given up. This is the best place to prove your point! If you succeed there, you have earned your place to speak. And when that happens, I will listen to you, follow you & I will even fight for you. Furthermore, if, after all that, you still choose to stay in the teaching profession, I will respect you.